The state party report on the Great Barrier Reef, submitted to UNESCO by the Australian government, is inaccurate and fails to acknowledge serious declines in the reef’s health. The state party report on the Great Barrier Reef, submitted to UNESCO on the weekend by the Australian government, is inaccurate and fails to acknowledge serious declines in the reef’s health. The report portrays the reef as remaining in good condition despite evidence from the government’s own scientists that it is suffering a serious decline in its health. “The state party report claims that Australian and Queensland government policies on the Great Barrier Reef are sufficient to avoid an in danger listing by the World Heritage Committee but this claim is undermined by the clear picture provided by the science,” said WWF-Australia CEO Dermot O’Gorman. The Australian government’s own strategic assessment shows that 24 out of the 41 metrics that collectively comprise the outstanding universal value of the Great Barrier Reef World Heritage Area have deteriorated since its inscription on the World Heritage List in 1981. Of the 24 diminished attributes, 10 are currently assessed as being poor, including corals, seagrass, marine turtles, dugong and seabirds – all of which are fundamental aspects of the original World Heritage listing. The Great Barrier Reef Marine Park Authority’s recent outlook report stated “even with the recent management initiatives to reduce threats and improve resilience, the overall outlook for the Great Barrier Reef is poor, has worsened since 2009 and is expected to further deteriorate in the future”. 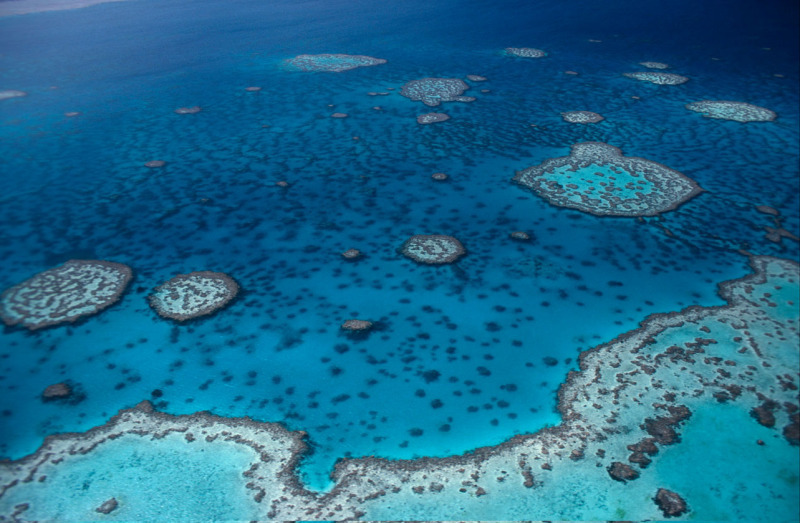 In October last year the Australian Academy of Science stated that “the integrity of the Great Barrier Reef World Heritage Area is declining, and the reef’s current system of governance is failing”. The academy further stated that with the serious depletion of marine species like turtles and dugongs, a 50% decline in coral cover, and an 80% decline of reproductive coral trout in fishing zones, there is no doubt that key World Heritage values of the reef are in serious decline. “The Australian government’s report to UNESCO does not provide an accurate assessment of the Great Barrier Reef’s condition, nor does it provide a convincing explanation of how the outstanding universal values of the reef will be restored,” Mr O’Gorman said. Hardy Reef, aerial view. Great Barrier Reef & Coral Sea, Australia.